Lawyers practise law freely and independently. They are subject to the law of their profession as well as to the habits and customs of the Bar of the Principality of Monaco fixing all professional rules and especially assuring professional secrecy. Nobody may practice as a lawyer without holding a master of law degree and passing the admission examination to the Monaco Bar. The avocats-défenseurs, avocats and trainee lawyers are subject to the same disciplinary and professional rules. In their capacity as representatives before judicial and administrative authorities, lawyers therefore also act as advisors for individuals as well as for trade companies, for important businesses as well as for craftsmen or workers. The committee of the Bar is responsible for the discipline of the members of the Bar, with the President of the Bar, to whom any person may apply. Under certain circumstances, the avocats-défenseurs, avocats and trainee lawyers are obliged to help those due to be tried enjoying legal aid. The status of avocats-défenseurs, avocats and trainee lawyers is regulated by Law n° 1047 of 28 July 1982 and Sovereign Order n° 8089 of 17 September 1984. The rates of costs and legal expenses awarded to avocats-défenseurs are regulated by Sovereign Order n° 15.173 of 8 January 2002. Avocats-défenseurs and avocats are representatives of the law. They practise law freely in order to defend the interests placed in their hands correctly. They must accomplish their task with dignity, conscientiousness and integrity. Avocats-défenseurs have authority to represent the parties and to plead before any court. Avocats have authority to plead before any court and to represent the parties before the criminal courts, the justice of the peace and the labour court and as provided for by the law. Trainee lawyers have authority to plead before the courts, except the Supreme Court and the High Court of Appeal; they are not allowed to represent any party. They must wear the gown of their profession while in court. The appointment of a trainee lawyer is subject to the following conditions: being a Monegasque national, enjoying civil rights, being beyond reproach, being the holder of a French master of law degree diploma issued by a French University of Law or of a similar diploma, not being called to a foreign bar and having passed an examination. The admission of a trainee lawyer is pronounced by the Directeur des Services judiciaires. There is a training period of three years. Trainee lawyers are to attend the hearings of the various courts on a regular basis, to defend legal aid or other cased referred to them by the court, to be working in the law office of an avocat-défenseur and to follow any lectures and training sessions at the courts. Once the three year training period has been finished successfully, the trainee lawyer is admitted to practise as an avocat by an order of the Directeur des Services judiciaires. An avocat, who has been practising sufficiently and successfully for five years, may apply for admission as an avocat-défenseur; and in this case, he or she will be appointed by a Sovereign Order. Besides the fees related to representing a client, avocats-défenseurs are entitled to claim fees for effort and care, consulting, final pleadings and other professional matters, the prices of which are not fixed. The avocats fix the amount of their fees for consultation and final pleadings themselves. Avocats-défenseurs, avocats and trainee lawyers are appointed in turn in accordance with the provisions of the Monaco codes of civil and penal procedure in order to take in legal aid representation and defence. They may not refuse their services. The parties may, in any matter, ask a lawyer called to a foreign bar to assume the defence of their case. Such lawyer must have been previously authorised to plead by the presiding judge of the court referred to. Such authorisation is always subject to being assisted by an avocat-défenseur in relation to both the proceedings and the preparation of written pleadings, save for the defence of a defendant person in criminal proceedings. 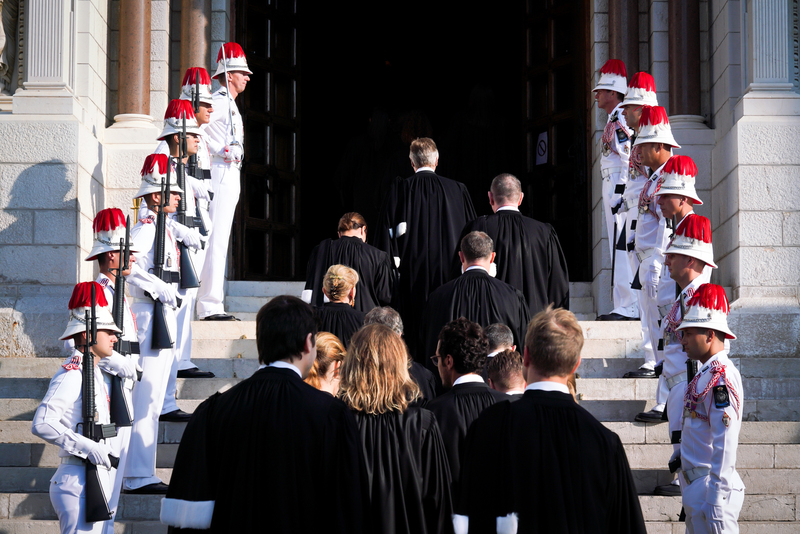 The avocats-défenseurs, the avocats and the trainees make up the Monaco Bar of avocats-défenseurs and avocats of the Court of Appeal of Monaco. The Bar has a legal status. The Bar is managed by a board consisting of a chairman called the President of the Bar (at present Maître Yann LAJOUX), of a syndic-rapporteur (Maître Bernard BENSA) and of a secrétaire-trésorier (Maître Hervé CAMPANA). Such committee is elected by the avocats-défenseurs and avocats for a one year period and the President of the Bar cannot hold his office for more than two consecutive years.